Pontevedra is a city with history, its beginnings go back to the ancient era. It is said that the city was founded by Teucro, one of the heroes of the Trojan War. This allow us to know how important Pontevedra is according to history and the importance that already have in the actual world and the importance that is going to have in the future. Pontevedra’s urbanism is in some way conditioned by the physical conditions of their territory, so the original urban planning of the city is adapted to this situation, being the “Rias Baixas” an important part of this, the city is planed around one of them. These headlines allow us to know a bit more about this ancient city with a pioneer urbanism model and how as a millennial city it reinvents itself with citizens as protagonists and urbanism and technology as allies. 7. Pontevedra has been considered a healthy city by the increase of green areas, places to practice sport, as well as its fluvial beach. Pontevedra is the perfect example about how is possible to create a “city model” focusing on people and how to make the city more sustainable without forget that the people who live in the city is as important as this idea. At the beginning this ideas was not the most popular one, due to the fact that citizens especially in the case of local shops were worried for their commerce. They thought that the prohibition of cars in the city centre would have a negative impactive in their sales. Nevertheless this is far from reality, the local commerce are doing better and even some of them are asking for more pedestrian zones. People have learnt and see how their quality of life have improved with this revolutionary urban planning model, even if at the beginning they were not enthusiastic about this Municipal General Town Planning Plan. Nowadays more and more people are getting engaged with this project that helps to improve their quality of life. 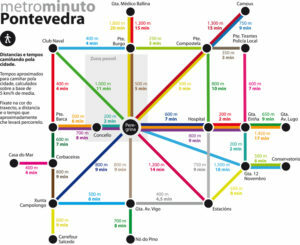 Besides Pontevedra was awarded in 2013 with the INTERMODES price for creating the first European pedestrian map: “El Metrominuto”, that shows the result of a policy of years prioritizing pedestrian mobility. accede walking to the city what is more comfortable, but even with that people who live in the outskirts of Pontevedra or even in near villages are still struggling with this issue. They say that these parking are not enough and they say that even some of them are not the safest places to leave your car. -Extension and adaptation of the people-centered urban transformation model: extending it to the peripheral neighbourhoods and the peripheral crown of medium density that surrounds the compact city, they try to create a city better connected with its peri-urban environment, to achieve more friendly, comfortable, safe and accessible urban spaces and a high urban quality that meet the standards reached in the most central grid of the city. And as we explain before the town hall is taking into account the “DUSI strategy” based in Model Urban Pontevedra that has as main challenge to deepen the model of urban transformation of Pontevedra focused on people, continuing, reinforcing and adapting its model not only in the urban centre but also in urban spaces of the edge and the urban peripheral crown that surrounds. Pontevedra is still really involved in sustainable urban planning and wants to become in a city model. From a urbanism and planning point of view creating a urban planning like this it is not easy at all, especially if we consider how in the actual world and particularly in Spain people centers their displacements in the use of car. This is what makes Pontevedra’s urban planning so special and innovative, being a city focus on the safety of their citizens and in achieve a Urban sustainable development strategy. As a special connotation Pontevedra is the perfect example about how the traditional urban planning is leading its place to the new “urban strategic management” explained by François Ascher. This new method comes up as a response to the uncertainty of the current situation; this method tries to take positive advantage of all kinds of events and developments related to strategic objectives and revolutionizes the old chronology used by traditional urban planning. 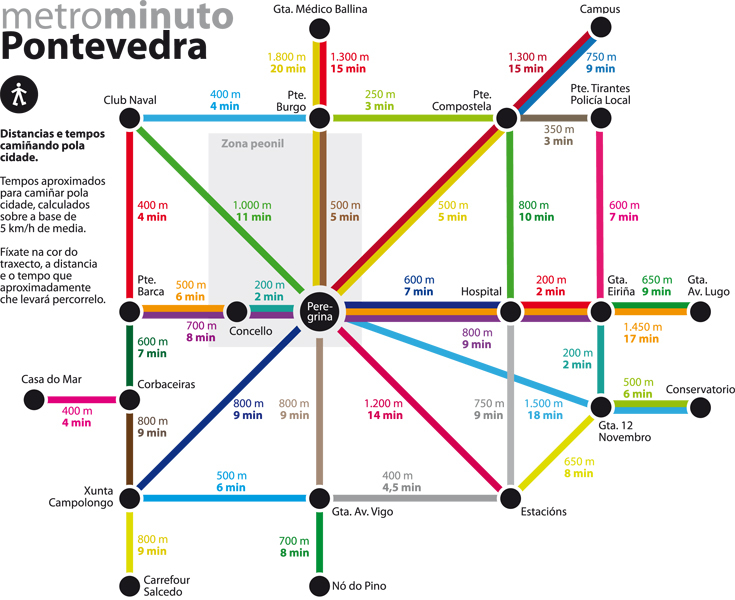 As a final conclusion Pontevedra is the perfect example about how cities can change and about how urban planning can focus their planning on people, at the end we are going to be the ones living there. Pontevedra is leading the new urban planning of the future, why don’t we take their example and try to make our cities more sustainable and oriented to citizens? abc. (2017). Pontevedra: un modelo internacional de ciudad con «movilidad responsable». [online] Available at: http://www.abc.es/motor/reportajes/abci-pontevedra-modelo-internacional-ciudad-movilidad-responsable-201512032039_noticia.html [Accessed 26 Jan. 2017]. Ascher, F. (2004). Los nuevos principios del urbanismo. 1st ed. Alianza Editorial. Anon, (2014). Pontevedra: un modelo de ciudad centrado en las personas. [online] Available at: https://intensificacioniga.files.wordpress.com/2014/11/a_02-pontevedra.pdf [Accessed 26 Jan. 2017]. Estrategia de Desarrollo Urbano Sostenible e integrado de Pontevedra. (2016). 1st ed. [ebook] Pontevedra. Available at: http://www.pontevedra.gal/web2015/wp-content/uploads/2016/01/URBAN_Mais-Modelo-Pontevedra.pdf [Accessed 26 Jan. 2017]. Pontevedra, mejor a pie. (2012). 1st ed. [ebook] Pontevedra. Available at: http://www.pontevedra.eu/pub/documentos/20140128070101_mejor_a_pie.pdf [Accessed 26 Jan. 2017]. Pontevedra Viva. (2017). Dubái ‘corona’ el modelo urbano de Pontevedra con el premio ONU-Hábitat – Pontevedra Viva. [online] Available at: http://pontevedraviva.com/xeral/18165/dubai-coroa-modelo-urbano-pontevedra-premio-onu-habitat/?lang=es [Accessed 26 Jan. 2017]. Twenergy.com. (2017). Pontevedra recibe el premio ONU Habitat por su modelo urbano peatonal – Twenergy. [online] Available at: https://twenergy.com/a/pontevedra-recibe-el-premio-onu-habitat-por-su-modelo-urbano-peatonal-1639 [Accessed 27 Jan. 2017].